Flagships from the world’s top phone makers square off. Forget about McGregor vs. Mayweather. The iPhone X vs Galaxy Note 8 is the true fight of 2017, and in this case, the matchup is more even than anyone could ever have imagined. Aside from their size, the Galaxy Note 8 and iPhone X have surprisingly similar designs. Both are made of metal and glass, feature edge-to-edge displays, and are equipped with dual-lens cameras. One major difference is that the Galaxy Note 8 holds onto its fingerprint sensor while the iPhone relies on facial recognition for unlocking its device. We won’t give Samsung too many points here. While the reliable and secure authentication method is a welcome feature, we wish it were positioned in a spot you can actually reach. Both phones sport a simple, agreeable design that focuses your attention on their expansive displays. There’s not much to said about the back of either device. Both phones are coated in a slab of glass and come with a relatively large camera module that houses dual lenses—the iPhone X with a vertical orientation, and Galaxy Note 8 with a horizontal one. Even though its display awkwardly cuts the notification bar in half at the top of the screen, we’re going to give this round to the iPhone X for its more wieldy frame and stainless steel build despite the Note’s better IP68 certification. Apple did exactly what was needed to keep up with Samsung, outfitting the iPhone X with an edge-to-edge OLED display (one likely supplied by Samsung). In fact, the main difference between these two phone’s screens isn’t the underlying technology but their respective size. The iPhone X comes with a 5.8-inch display while the Note 8 is equipped with significantly larger 6.3-inch glass. Other subtle differences are the Note 8’s slightly curved edges and the iPhone’s ugly front-facing TrueDepth camera cutout. Nevertheless, both displays should be bright, detailed, and rich with accurate, saturated colors and deep blacks. We’ll have to wait to get our hands on the X before comparing the quality of these top-notch displays, but we’ll give this round to the Note 8 for its more natural appearance and pleasing curves. The Samsung vs. Apple camera war wages on. The Galaxy Note 8’s camera is fantastic but not perfect. Samsung still insists on amping up color saturation to borderline unnatural levels, and its dynamic range, while very good, still trails that of the Pixel and U11. That gives the X a small margin of error to take advantage of. However, Apple did a good job at its launch event convincing us that the X’s cameras are the best it has ever released. On paper, these phone’s cameras are practically identical. They’re equipped with dual 12MP lenses, both with optical image stabilization and wide-angle f/1.8 apertures on the primary lens. They also come with fancy features like facial recognition and portrait mode (called selective focus on the Note). You can also shoot video in 4K at 60 frames per second. That doesn’t mean the photos they produce will be of equal quality, but it’s impossible to decide a victor without testing them side-by-side. Both phones come with many of the same features, including facial recognition with iris scanning, wireless charging, and personal assistants in Bixby and Siri. We could go on and on comparing every feature in Samsung’s version of Android and iOS 11. Instead, we’ll mention the ones that make these phones stand out from anything else on the market. Following tradition, the Note’s highlight feature is the S Pen, which lets users take notes and draw on their display using some nifty Samsung software. It works very well, but is still niche and doesn’t, by itself, justify a huge price increase over the competition. On the other hand, the iPhone X is all about augmented reality and using its dual-lenses to create futuristic AR content. We’ll have to wait and see if this ends up being a game-changer or a gimmick, but as we saw with Pokémon Go, the potential is there. We’ll give this round to Apple for now for its more forward-thinking AR features and because of some of the Note 8’s missteps, like Bixby and facial recognition software, which aren’t ready for prime-time. I don’t expect either of these phone’s speakers to sound very good considering their edge-to-edge displays take front-firing speakers out of the equation. The Note 8 sounded weak in my testing, and the iPhone 8’s bottom-firing speaker placement isn’t convincing. If you want room-filling audio, we suggest you buy a Bluetooth speaker. And unlike LG and Sony phones, which both include dedicated DACs, neither Samsung or Apple do anything special to enhance the audio quality of headphones. But Apple remained in this fight, and Samsung landed the knockout blow—the iPhone X doesn’t have a headphone jack, and the Note 8 does. Round over. Early reviews of the Note 8 suggest its battery life is among some of the longest lasting phones out there, despite having a smaller 3,300 mAh capacity than its short-lived predecessor. Most reviewers are easily getting through a day of medium to heavy use, a solid, albeit unexciting result. We were impressed with the battery life of the iPhone 7 Plus, but it looks like the iPhone X may not reach those levels. Apple upped the battery capacity in its flagship, but it’s unclear how much. Apple also said the X should last two more hours than the iPhone 7 on a single charge, but that’s somewhat ambiguous. The iPhone 7 was specced at 14 hours of talk time, 14 hours of internet use over Wi-Fi, and 12 hours of internet use over cellular, so we should expect at least that much out of the iPhone X. Finally, both phones now support Qi wireless charging, which should make keeping the devices juiced up more convenient. Again, it’s tough to call a winner in this round, so we’ll wait for our final review. 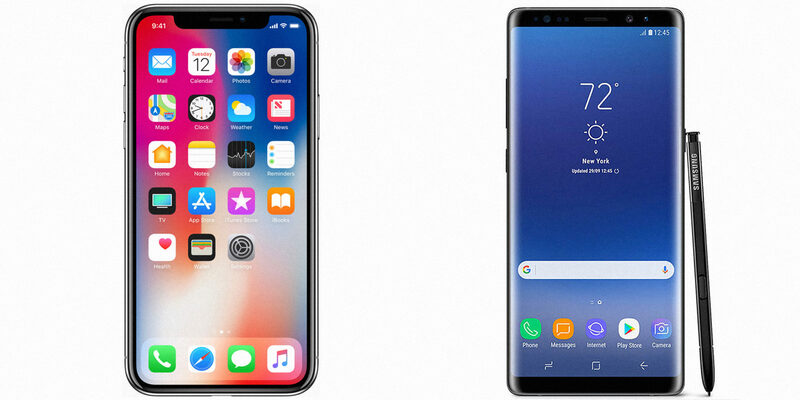 The iPhone X and Galaxy Note 8 are two very impressive devices, representing the current height of smartphone hardware. As much as we’d like to name a definitive winner, these two are simply too close on paper to make even a majority decision. It feels like such a cop out, but the truth is that your buying decision between the X and Note 8 should come down to whichever operating system you prefer: iOS 11 or Android Oreo. Rest assured, you’ll be happy with whichever device you choose in this battle. That is if you’re willing to spend $1,000 on your next smartphone. Editor’s note: We’ll update this article once we get our hands on an iPhone X.